Posted on 14, March 2016 by EuropaWire PR Editors | This entry was posted in Automotive, Germany, Industrial and tagged Benecke-Kaliko, Dr. Dirk Leiß, Dr. Ralf Cramer. Bookmark the permalink. Hanover/Changzhou, 14-Mar-2016 — /EuropaWire/ — Following a year of construction, surface specialist Benecke-Kaliko has officially opened a new plant in Changzhou, China to manufacture the environment-friendly, low-emission and non-allergenic automotive interior materials Acella Eco und Acella Eco green. Series production has been running since the end of 2015 with an approx. 100-strong workforce; 50 more jobs are to be added over the next few months. The company, a member of Continental Corporation, has invested 40 million euros in the first phase of the expansion – the largest investment in its history. “This underlines the great importance of the Chinese market for us, as well as the excellent relations that Benecke-Kaliko has with its partners in the local automotive industry,” emphasizes Dr. Dirk Leiß, Benecke-Kaliko’s CEO. The new plant has doubled the company’s capacity for Acella in China and is now well-positioned to respond to the high level of demand from the Chinese automotive industry for its surface materials. Acella features outstanding functionality and durability and serves as an enabling solution for vehicle manufacturers to meet the stringent statutory requirements pertaining to the air quality of the passenger compartment. Benecke-Kaliko has been developing odor-neutral and low-emission trim and upholstery materials for decades. The new plant operated by Benecke Changshun ECO Trim, a joint venture between Benecke-Kaliko and its Chinese partner Jiangsu Changshun Group Co., Ltd, will produce around 10 million m2 of the surface material Acella Eco annually. Water-based paints will be used exclusively at this facility, which reduce the emissions of the material to a minimum and guarantee environment-friendly production. Acella Eco is also suitable for long-term, direct contact with drivers and passenger skin. It is mainly used for vehicle seats and arm rests. A second expansion phase for the new facility is planned if demand continues to rise. All the jobs in the new plant are covered by extremely rigorous safety and environmental regulations. A high degree of automation ensures consistently reproducible production standards. “Our second plant in China is making a significant contribution to our continued successful global market penetration and thus, offering crucial benefits to our customers,” declares Leiß. “From our Changzhou base, we can reach all of our automotive customers’ plants quickly and easily. We have also been collaborating for some time with scientists from the local university,” he says, explaining the reasons behind the choice of location. Benecke-Kaliko has been manufacturing in China in conjunction with its joint-venture partner since 2005. At its Zhangjiagang site, the Benecke-Changshun Auto Trim joint venture manufactures Xpreshn and Xpreshn HD compact and expanded foils and Acella trim and upholstery material. The new plant will focus on the especially environment-friendly products Acella Eco and Acella Eco green in order to satisfy the increase in demand in this area and to free up capacity in Zhangjiagang for orders which have already been placed. Benecke-Changshun also operates an R&D center in Zhangjiagang with the main tasks of advancing production processes and product development for the Chinese market. In addition, a dedicated design office was set up there a year ago. The Benecke-Kaliko Group, headquartered in Hanover, Germany, operates seven manufacturing facilities located in Germany, Spain, Poland, China and Mexico. The company has a worldwide presence – in North and South America as well as in Asia – thanks to joint ventures and collaborative partnerships. In 2015 Benecke-Kaliko and its more than 2,500 employees generated annual sales of about 549 million euros. 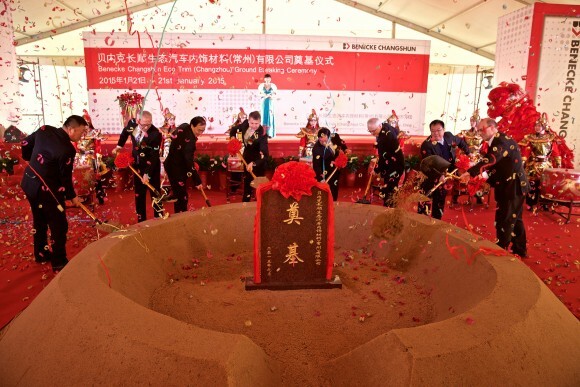 Looking back: Ground-breaking ceremony for Benecke-Kaliko’s new plant in Changzhou in January 2015.